Being Korean American, my family had a lot of learning to do in the American culture department. Peeled apple on a chopstick was my lollipop. I once heard Oprah say that moms who lovingly cut the crust off their kids’ sandwiches – THAT was love. I needed to know mom loved me so I got her on that right away. Christmas was an awkward time when we’d all sit around and stare at each other before slowly receding to our rooms to read or study. There was one time we tried to do presents, and I got wire hangers. I don’t think I’ve ever gotten over the trauma of that gem of an experience. Perhaps the most successful example of how we adapted to the American way of life is Thanksgiving. Once my siblings and I left home to attend college as far away as possible from Texas (Boston, Pittsburgh, Philadelphia, and Chicago), we’d gather at my oldest sister’s house in Philadelphia to do the thanksgiving. It was a perfect holiday. No parents and the freedom to cook amazing thanksgiving dishes we hadn’t had a chance to cook yet. It’s how I discovered how to roast a turkey. We made a green bean casserole that actually tasted good, and it finally made sense to me why people ate them. Since coming to Korea, I haven’t done Thanksgiving. My family here is Korean, and asking them to celebrate Thanksgiving for my sake would be like asking them to observe Kwansaa. But this is the first year that my sister has come to live with me in Korea. For us, two is more than enough family to do Thanksgiving. Of course, that number quickly became ten as close friends were invited to celebrate with us. Turkey is essential to Thanksgiving. That’s why it’s called Turkey Day. Haddon Supermarket in Oksu-dong has huge turkeys for 125,000 won. More than the fact that I don’t want to spend an obscene amount on turkey, I have no way for cooking it. I only have a small convection oven. So, I found some large turkey breasts at High Street Market in Itaewon, and decided I’d stretch my won by making turducken rolls. For those of you who don’t know, turducken is a chicken stuffed in a duck stuffed in a turkey. I was impressed until I read about rôti sans pareil (roast without equal). In the 17th century, a French gastronomist stuffed seventeen birds inside each other. Half of these birds are now extinct. To start, mix together the garlic powder, cayenne pepper, salt, and black pepper. Keep the seasoning in a bowl to season each of the meats easily. Once you’re down with the turducken, the seasoning will be cakey with raw poultry juices, so throw it out. Cover the turkey breast with a layer of plastic wrap. Grab a heavy rolling pin or a heavy-bottomed saucepan and pound the turkey breast to an even thickness. Do the same with the duck and chicken. In the pictures below, there are three turkey breasts and three chicken breasts because I’m tripling the recipe to feed ten people. I couldn’t find duck breast so I used sliced duck. 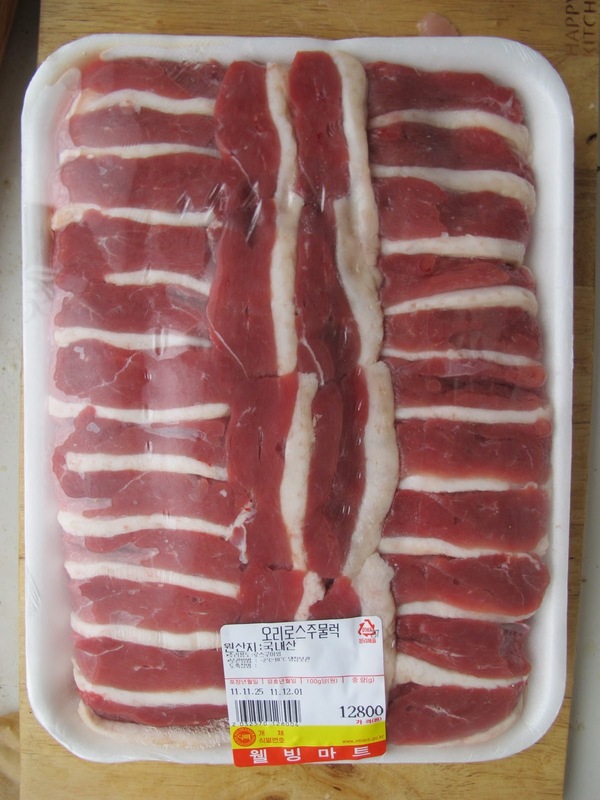 Lay out the bacon strips side by side with a length of twine running under the middle of each bacon slice. The twine should be cut so that it’s about two inches longer than the bacon slice on both ends. If you’re using toothpicks, you can skip this step. On top of the bacon, center the turkey breast. First season the turkey breast with a few healthy pinches of the garlic powder, salt and pepper seasoning. Spoon about 1/2 – 3/4 cup of the prepared stuffing and spread it into an even layer. I used boxed stuffing, and made a separate stuffing to be served with the meal. Whatever stuffing you decide to use, be sure it has small croutons. You can also use a rice stuffing. Next, top the turkey and stuffing with the duck. Season it. 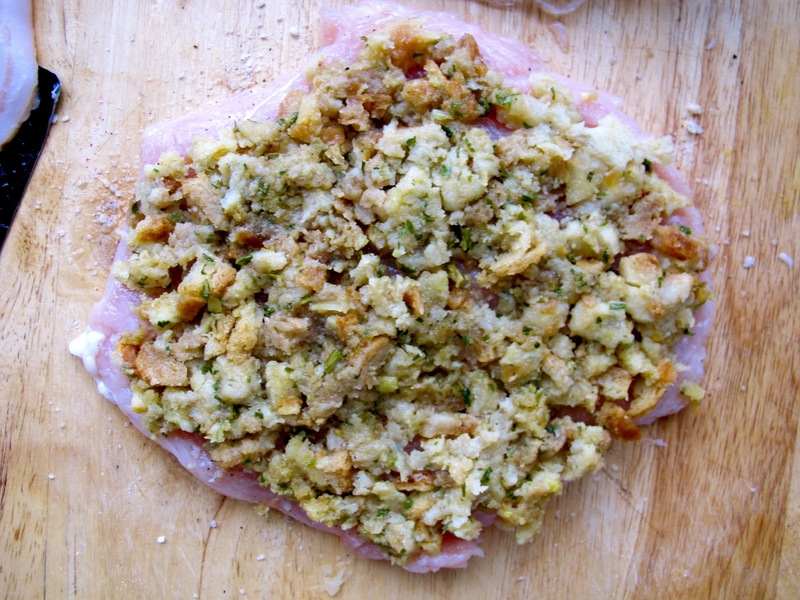 Then top it with a thinner layer of stuffing, using about half a cup of stuffing. Layer with the chicken breast. Season. Spread the stuffing but use a very small amount. Roll the two long sides up like a taco shell and fold it into a roll. Bring up the two sides of the bacon to wrap the turducken roll. 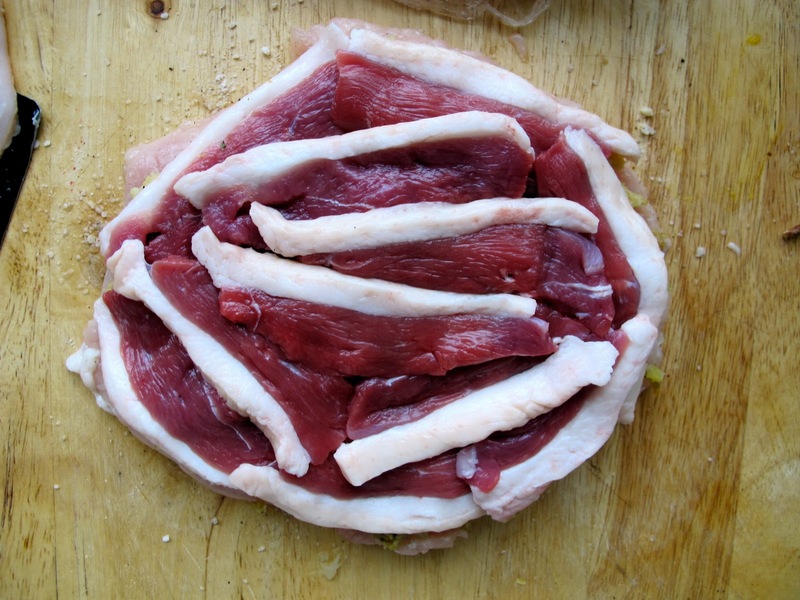 Then use the twine to tie the turducken up. Or use toothpicks to secure. So cute I wanted to coddle it over my shoulder like my little bacon baby. Place the turducken in a roasting pan. Tent a sheet of foil over the turducken so that it doesn’t burn. Cook for 45 minutes then remove the foil and spoon the pan drippings all over the top of the roll so it doesn’t dry out. Cook for another 30 minutes or so until the internal temperature of the roll reaches 165 degrees F (74 degrees C). Let the roll rest for 10-15 minutes. Then serve. Use the pan drippings to make a quick gravy. Over medium heat, whisk the flour into the pan drippings to create the roux. Whisk for about two minutes until the flour is cooked and the roux is a nice, golden brown paste. Then whisk in the chicken stock/broth. Bring to a boil then simmer until the mixture is reduced by a third. Season with salt and pepper. You can choose to strain the gravy if you want it perfectly smooth. All the things that still need to finish in the oven (except the pumpkin pie). I look like a hungry homeless person because I had been cooking for TWO DAYS STRAIGHT. Served over a bed of smoked oyster and bacon stuffing. Turducken Roll Recipe is mt favorite recipe. Which i make it tonight. It such a very delicious. It sounds like a testy and yummy. I am in love! Turducken in Korea?? ?